Cold November waters on a bouncy 18-foot walleye boat made the perfect setting for an unforgettable oldsquaw hunt. Three miles from shore, the morning's first bath of Lake Michigan spit across my cheeks as Rob Andersen steered his 18-foot walleye boat into the growing swells. I shivered instinctively, and then smiled. I couldn't help but equate the gentle dousing of frigid water as a baptism of sorts. Although I had hunted ducks in Wisconsin for 30 seasons, I'd never experienced anything remotely close to this ride. Never saw a live oldsquaw before, either. "We're not out far enough yet," instructed Rod Whitehead of Phelps, Wis. "Keep going!" Whitehead, owner of Easy Pluck bird dressing systems, was the veteran deck hand on our expedition. He had hunted sea ducks in open water previously -- twice. The outboard roared. As Andersen pushed the craft farther from shore, I squinted, scanning the sea horizon for ducks. "There!" I shouted, thrusting my hand to point at a half-dozen speeding forms off of the bow. "Oldsquaws," Whitehead declared with a salty grin. "Let's go out farther. There'll be more." A minute of throttle later, birds were buzzing all around us. The work began the second we stopped. The first task was to deploy a dual boat anchor system in 65 feet of water. Next, we set a pair of longlines rigged with diver and sea duck decoys. Sounds simple. It wasn't. Setup took an hour. Hundreds of ducks whizzed past while we fought sea swells and shifting winds. Finally, we were ready to fire. We had no cover, so we attempted to stay low in the boat and to hold still. Honestly, I'm not sure it mattered. The oldsquaws, nowadays known by the more politically correct moniker "long-tailed ducks," seemed to follow a predetermined flight path. With a raft of thousands of the colorful ducks sitting offshore, we were bound to have visitors. Most would skirt the edge of the decoy line, but every so often, a single or pair would wing right through the heart of our operation. Our goal was to shoot mature drakes -- the longtails. We had missed a couple of frustratingly longish shots at handsome drakes early on, so when a young drake crossed too close behind the motor, I snapped and fired. We unhooked the boat anchors and retrieved the first duck of our voyage. It wasn't the taxidermy specimen I was hoping to collect, but I was proud nonetheless. Connecting on a fleeing 50-mile-per-hour duck while bobbing like a corked bottle atop 4-foot sea swells and wind-driven chop is no easy feat. I made another discovery on that November day: Shooting oldsquaws in those conditions is easier than videoing hunters shooting oldsquaws in those conditions. Ducks pushed past in breathtaking waves. We rocked. We rolled. We blasted. All three of us collected stunning long-tailed drakes, and I managed to capture footage of Andersen folding a duck on the tepid waters of Lake Michigan. 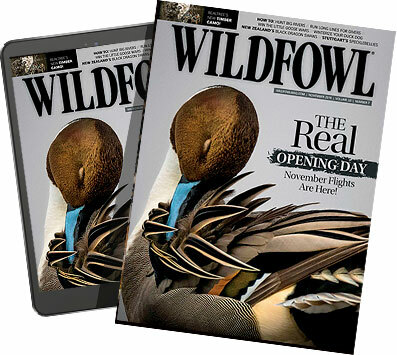 At hunt's end, I brought ashore a trophy for the wall and a video clip for the Wildfowl Web site. More importantly, we had shared an unforgettable duck hunt.